Each month as part of this series from the AAS Historical Astronomy Division, an important discovery or memorable event in the history of astronomy will be highlighted. This month's guest author Jason E. Ybarra (Bridgewater College) focuses on the 400th anniversary of Kepler's third (or harmonic) law of planetary motion. Interested in writing a short (500 word) column? Instructions along wth previous history columns are available on the HAD webpage. Kepler’s discovery had two profound effects. First, it provided another nail in the coffin for the Ptolemaic geocentric model. By placing the Sun at the center of the Universe, Copernicus showed that relative distance between the Sun and the planets could be geometrically determined from observations. Secondly, perhaps even more importantly, it had predictive potential.1 In book four of Kepler’s Epitome, published a year later, he applies the harmonic law to the motions of the Galilean moons. 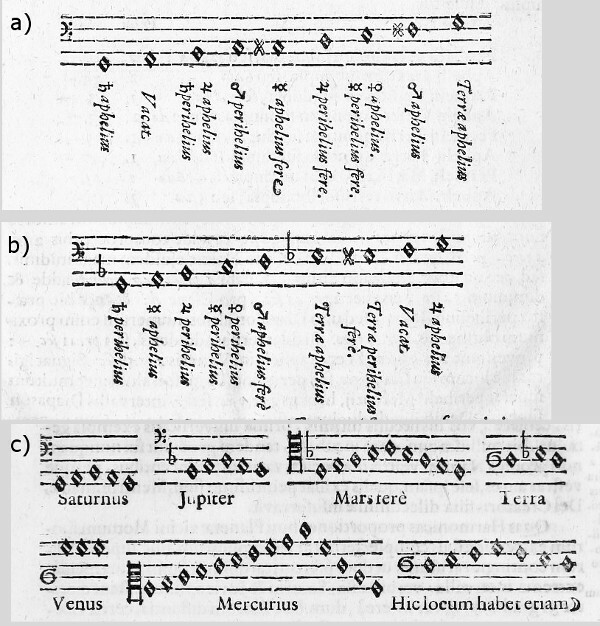 Of the contents of Kepler’s Harmonices Mundi, only the harmonic law endured. Sixty-eight years after the publication of Harmonices Mundi, Isaac Newton published his three-volume Principia Mathematica containing the foundations of classical mechanics. In book three of Principia, De mundi systemate, Newton showed that Kepler's harmonic law, along with Kepler’s other two laws of motion, are a consequence of his Law of Universal Gravitation.